CINCINNATI, Ohio --Several Deer Park Jr./Sr. High School students are enjoying an innovative opportunity that is only offered in around a dozen schools throughout the area. 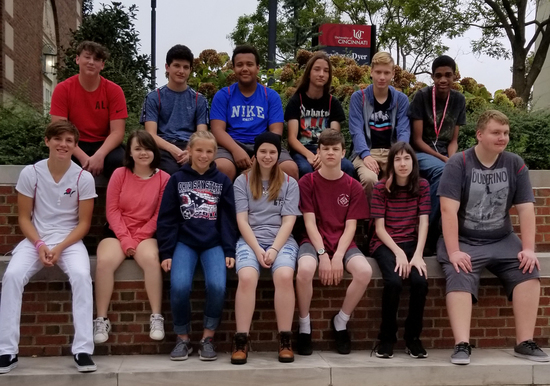 This year, Deer Park schools launched the UCIT program in conjunction with the University of Cincinnati, and 17 students are taking part in the program this fall. The program offers first-year college courses in the Information Technology track to Deer Park students, beginning as soon as their freshman year in high school. The program allows students to finish all of their college freshman IT courses during high school, accelerating their college track in order to complete a master’s degree—along with co-op experience—in four years after graduating high school. This fall, the students are taking Fundamentals of Technology, which includes lessons on different parts of the computer—such as hardware, software and memory. The class also teaches about the new platforms of communication the internet has created and how collaboration of work has changed since the technological age. The students will close the semester by building a website that will showcase their IT skills that they have gained in the first half of the year, such as infrastructure, hardware, and networks. They have also enjoyed perks of the program, which includes a visit to the UC campus to meet with the Dean of the IT program, a tour of campus, and a meeting with the college of education service advisor to learn about the criteria that comes with being accepted to the IT program. All students who complete the high school track with a grade of a C- or above will automatically earn acceptance into the Bachelors of Science in Information Technology program at UC. Upon graduation from high school, students enrolled in the program will have the opportunity to complete up to five semesters of co-op experience, earning up to $45k in college tuition in order to help offset tuition costs. Next semester, the students will be offered Fundamentals of Web Development, where they will be involved in hands-on experience of how to build websites from scratch. They will also be attending an IT Expo at UC this coming spring, which will include a presentation from Deer Park graduate Tyler Jones (Class of 2012).